Joe Bullock was very happy with this buck which he took using a special California Golden Opportunity deer tag which he purchased as high bidder at a fund-raising dinner. 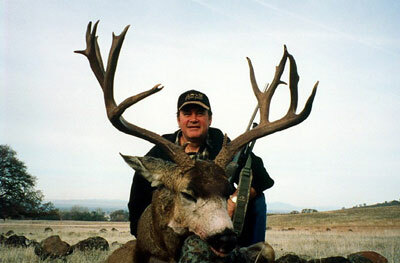 Bullock shot the buck on December 3, 2000, which was also his birthday, while hunting on Dye Creek Ranch in northern California. This was the 23rd buck that he had looked at that day between 11 a.m. and 4:45 p.m. Its rack is 28-inches wide and 18-inches tall. It is a 4x4 with a bunch of cheater points on it  or you could say it's a 9x6. Either way, it is the second-largest buck ever taken on Dye Creek Ranch. It scored 172 2/8 SCI.